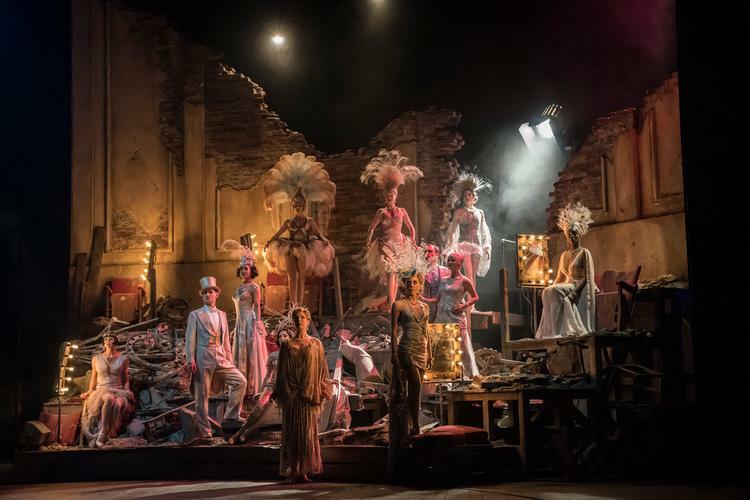 The sparkles of show business meet sweet nostalgia in the glamorous return of Follies at the National Theatre. After a smashing sold out last year, the production is back for a new 2019 run. The musical is a lavish extravaganza, raising memories, regrets, and passions in its protagonists and wonderfully entertaining the audience. Weismann's girls and friends meet for the first time 30 years after the last show. The theatre that used to host the Follies in between the two world wars is about to be demolished. Drinking and chatting now walking through the wings, now taking a seat on the disused chairs, the ladies, slowed down by the age, see themselves and the time past as the golden era, the fertile soil from where their fortune or bad luck sprang. Sally (Joanna Riding), wife of Buddy (Peter Forbes), is very excited, especially when she meets her once lover Ben (Alexander Hanson), who is now married to her ex roommate Phyllis (Janie Dee). The four are enraptured more than all the other guests by what it was and what it could have been of their lives, set among those walls, up and down those staircases, together or with another matching. The ghosts of the ladies graciously swift around in splendid costumes and striking high poses. There is quite a number of winning elements in this production, but a couple top them all. And this is one: the setting and the props. Although never too crowded, the stage is often occupied by walls, seats, curtains or it is left half empty, for the rotating platform to move freely, depending on the dramatic moments. The dresses from the past, the elegant gowns of the present, and the eccentric outfits of the follies are gorgeously elaborated, incredibly uplifting the overall level of the show. Getting at the heart and soul of the performance, there are not many words more apt to describe the dazzling talents of the cast than superb. The musical scenes represent a small variety of what the sounds and movements must have been like in the postwar America. Waiting for the girls upstairs, with its light notes and the catchy tune, returns from time to time in the show. Geraldine Fitzgerald executes an intense act in her Ah, Paris! A gem in this rollercoaster of feelings, memories, and pirouettes is definitely Who’s that woman?, where the whole ensemble exceptionally performs as a unique body, in a sleek piece of tip tap and powerful singing (especially by Dawn Hope). The show starts slow, as it gives an overview - although not flowing very well from the start - of the different lives of the Weismann's girls, dragging the audience in the enchanting medley of past and present that the old venue evokes. Once the main stories are set, the complicated relationships become more engaging, up until the climax of the four final follies, a remarkable sequence of fun and paradoxes, in perfect alignment with the ethereal atmosphere of the theatre. From here, the frenzy paced Buddy’s Blues and the effervescent dance of Janie Dee in The Story of Lucy and Jessie are definitely the highlights. We cannot forget to mention that all the music is performed with gusto by an exceptional orchestra of twenty one, hidden on the background, but beautifully present in every single moment with their notes. The charm of the twinkling costumes, the perfect coordination of such a significant number of cast members on stage - forty - makes Follies a unique production, that speaks of the past, but depicting the common illusions and yearnings of every human being.